How about a higher end memorabilia item? 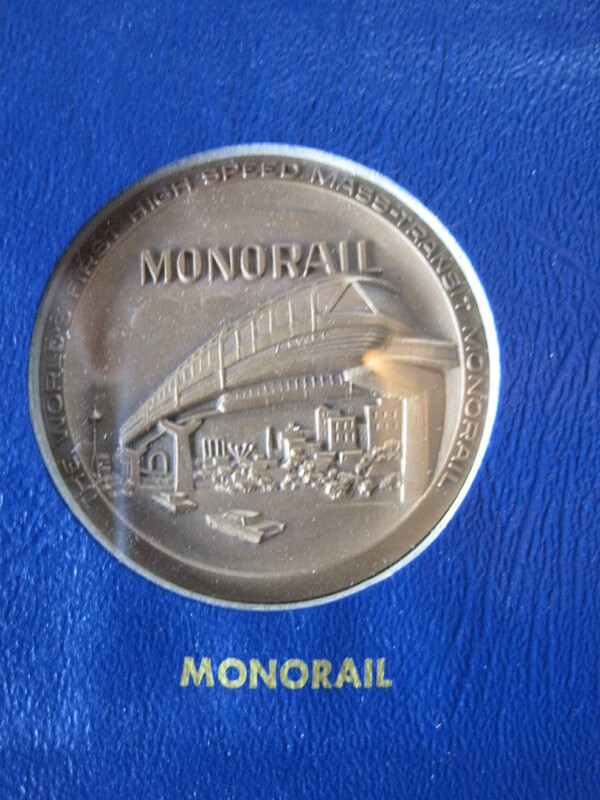 Nothing says spending a bit more to remember an occasion than the official medals of an exposition. The hunt for my Mini Museum is as much the fun of it as actually possessing the items. When I find something so very different I get pretty dang excited. This is how the medal find came down. The last weekend of estate sales was the weekend before Christmas. I went to two of them. 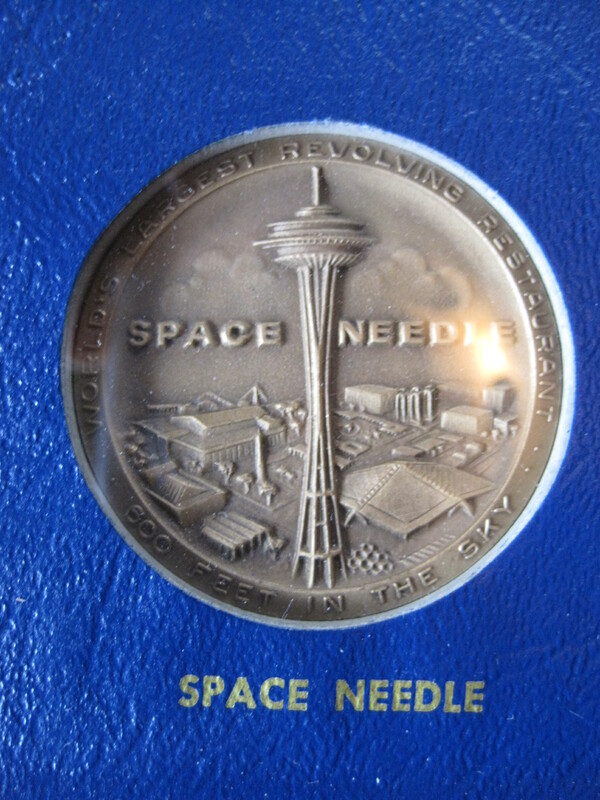 The first was nice and I bought an eclectic set of things – a metal spatula, a WWII Rand McNally map and a small Space Needle Tie Tack (missing the back end and kind of degraded in general). The second one was at a site where estate sale companies hold their events when the person does not want it in the house or they have excess items to dispose of. This one was a mixture of several sales. It had lots of jewelry, expensive art, collectables and a huge NASCAR cast cars collection. 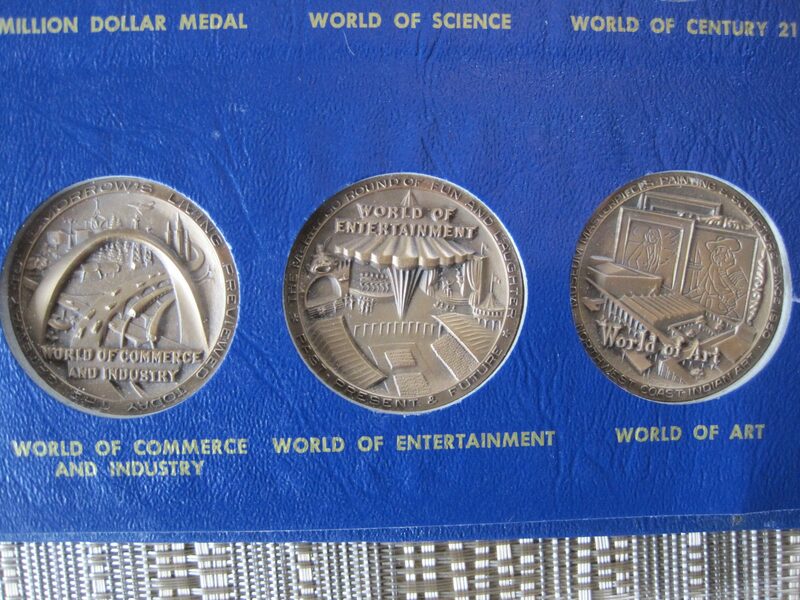 While browsing the jewelry I told the lady I collected Worlds Fair items. She perked up and grabbed an item I had totally missed. 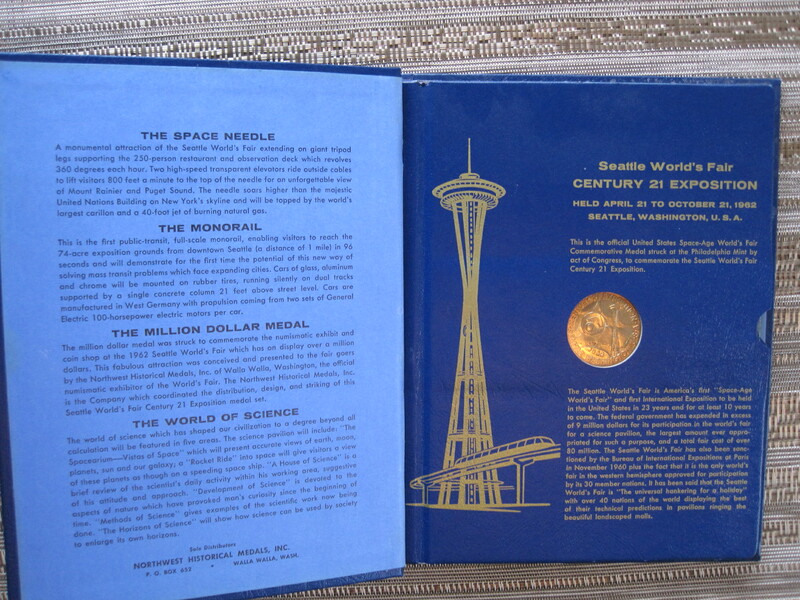 The Official bronze Medals bound in a little book made specifically for them. Just like a fancy coin collection should be. It was a good price but still expensive. However, now that I have collected all the glasses, plates and small items I can find, these more top shelf items are very enticing. I asked the main guy to give me a deal and he did. I left it at the check out table and went browsing the rest of the sale. As I wandered around he came back to me and said the magic words… everything is half off now and the deal just got really reasonable for me. Ok – enough of the hunt story and my bargain. 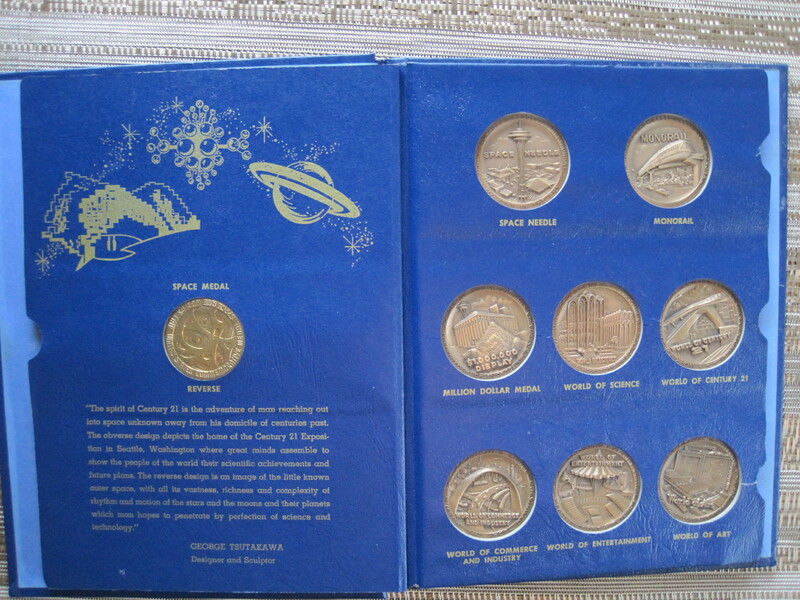 Here are the Commemorative Medals book pages in greater detail. This set is the bronze version. They were made in gold, silver and bronze. 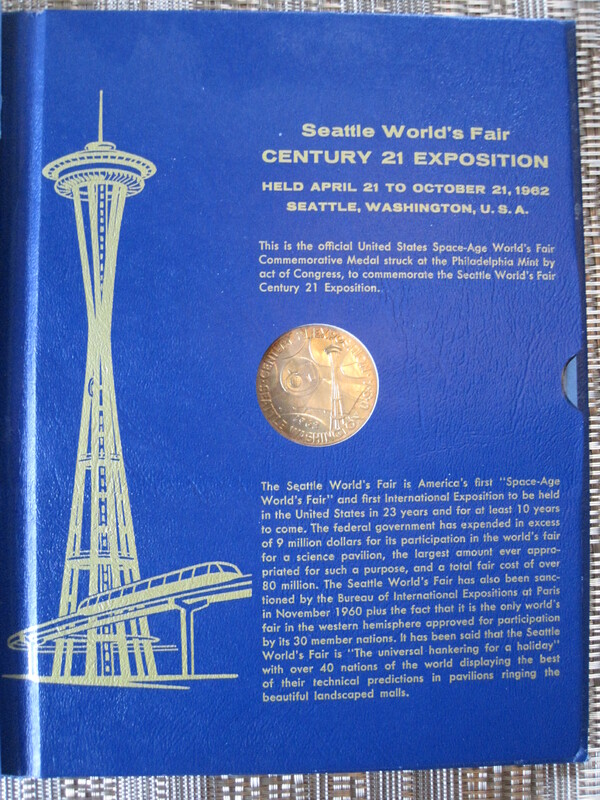 According to the Seattle World’s Fair Collectors site (62worldsfair.com) they made only 4 sets of the gold, 15,000 silver and 40,000 bronze. They were the high relief type and came in a 9 coin set. The Gold were not for sale and one is in the Smithsonian. Silver was $112.50 and the Bronze was $28.50. I paid slightly more than the original price for my set and they are listed between $225 to $120 when I researched them. 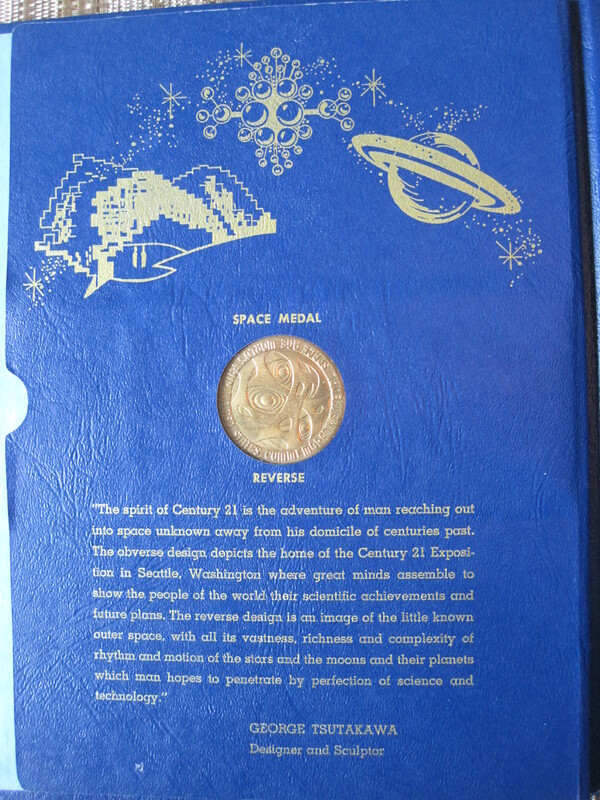 My favorite is the star coin “the Space Medal” minted at the US Mint and designed by the famous designer & sculptor George Tsutakawa. 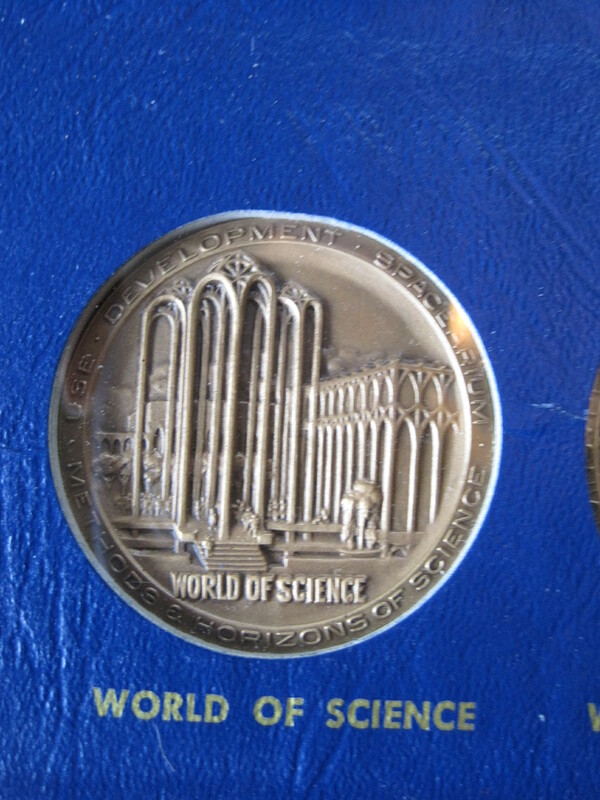 This was to commemorate the first “Space Age World’s Fair”. The reverse is even better. 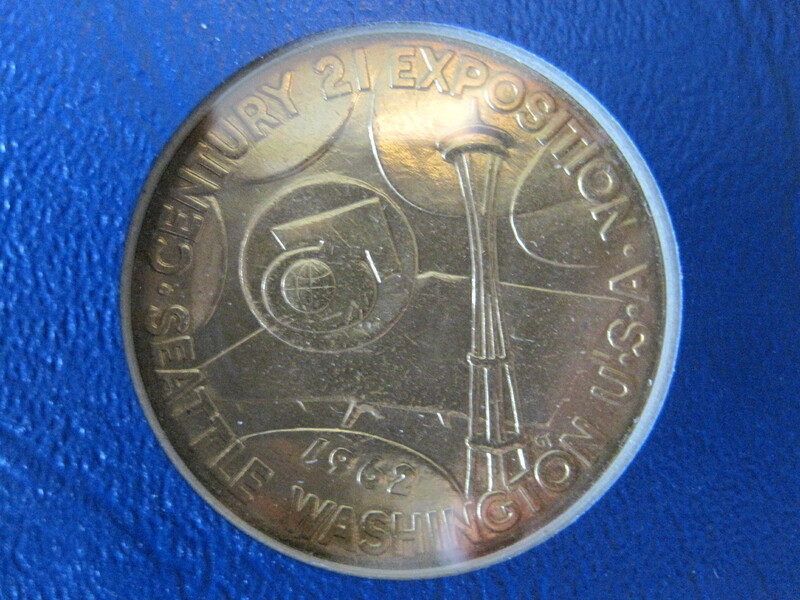 The front commemorates the fair with the logo and space needle on top of the Washington State Pavilion (aka Coliseum or Key Arena). 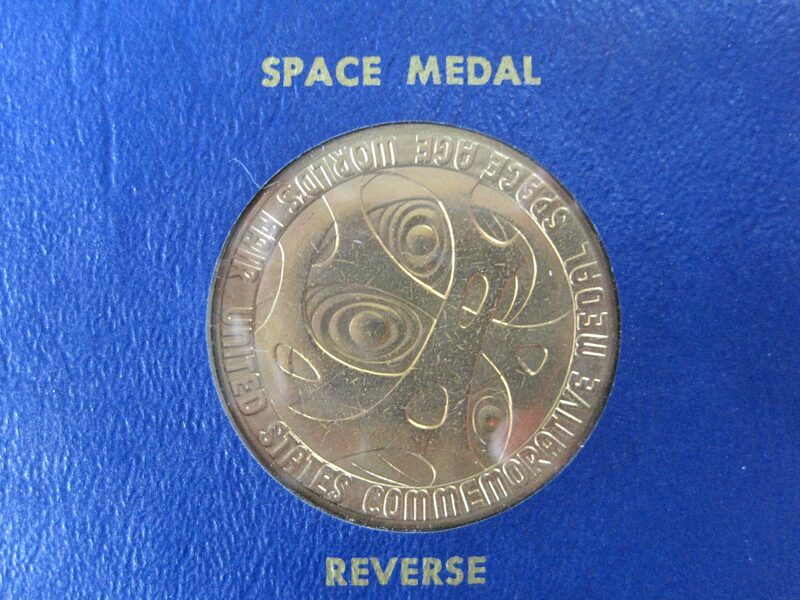 The reverse is the artists expression of outer space. It is timeless art in how he crafted the design. The book highlights it with cosmic illustrations and mankind’s adventure into the unknown far away from his home on earth. As a child of the 1960s, I am still fascinated by man’s exploration into space. Man walked on the moon not too many years after I visited the Century 21 Exposition. The medal collection brings back all the memories of black and white televisions wheeled into the classroom to watch a space launch. 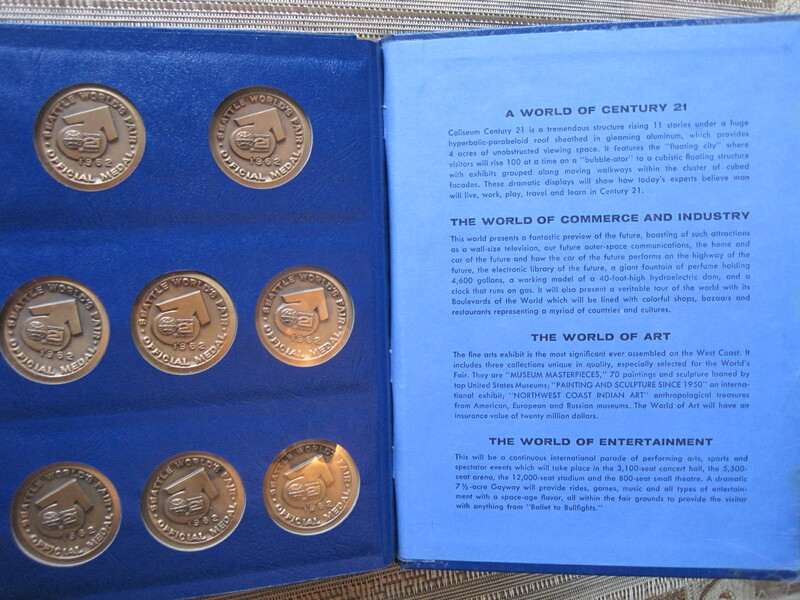 The rest of the collection highlights all the key exhibitions and sights of the fair with their reverse showing the Century 21 logo (top feature photo). The Space Needle and Monorail are at the top of the arrangement. 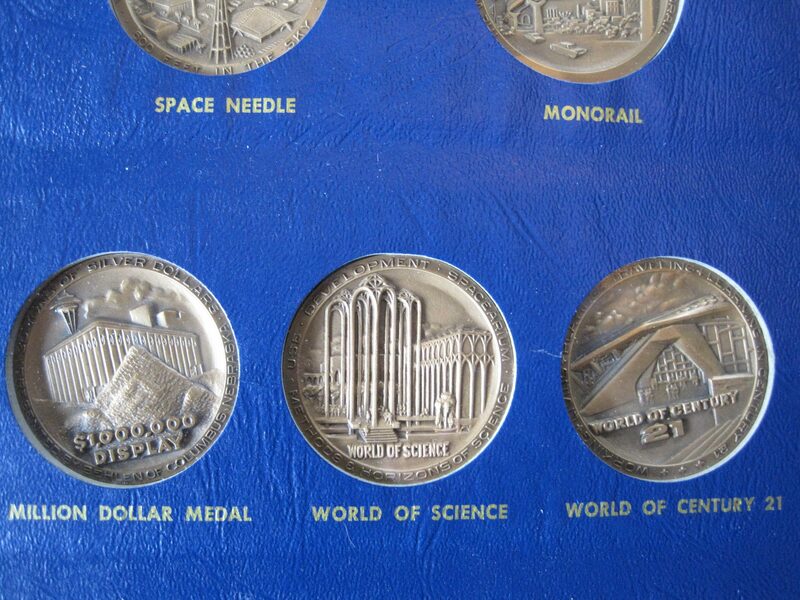 Next comes the middle tier with the Million Dollar Display (where these medals were sold) along with a huge coin collection, the World of Century 21 (the Washington State Pavilion) and the World of Science (the US Science Pavilion now the Pacific Science Center). The bottom row is World of Commerce, World of Entertainment and World of Art. They are all stylized views of large areas of the fair grounds. Thank you for visiting my Worlds Fair Blog. 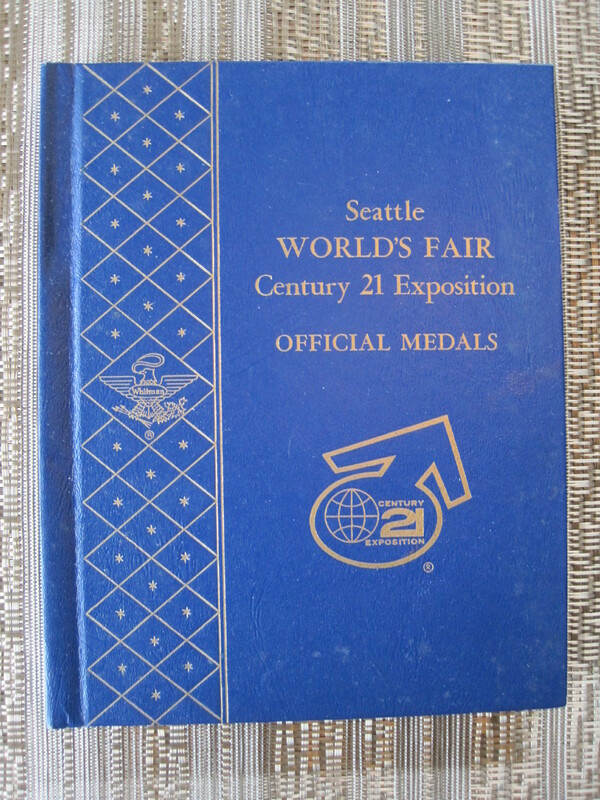 Hope you enjoy my rambling around the Seattle area in search of all things that are World’s Fairs Memorabilia.